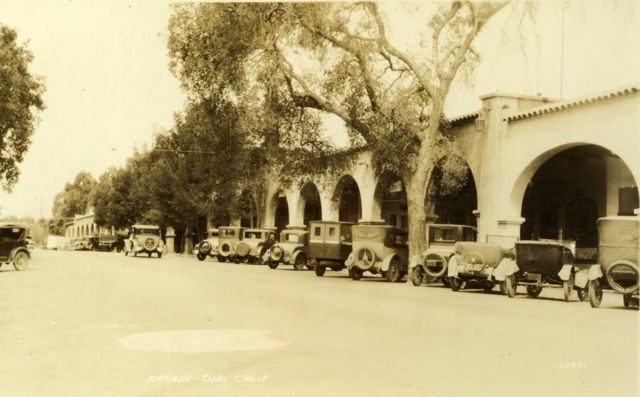 The automobile would make front-page headlines in The Ojai newspaper as well as across the United States. Stories involving the automobile were constantly being reported as the latest news. Mr. and Mrs. Theodore Roosevelt Jr. motored into the Ojai Valley from Carpinteria in 1910 and expressed themselves as “delighted with what they saw.” By 1910, North America had 80 automobile manufacturers, but cars weren’t being mass produced until Henry Ford introduced his new technique for commercial production in 1913. In 1916: “E. D. Libbey Motors into Town…arrived here yesterday in one of the family Packards, driven by chauffeur Johns.” Mr. Libbey’s arrival in the valley was a highly anticipated event for Mr. Libbey had been the Ojai Valley’s greatest benefactor. In the early days there was of course, some friction between auto drivers and horsemen. Generally, the automobile people were quite understanding and would often pull to the side of the road and shut off the motor until the horse had passed. One memorable incident involving a horse and automobile collision would become part of the valley’s history. Howard Bald, a member of one of the valley’s pioneer families, bought a rather attractive colt for a very few dollars because of her questionable character. After several months of training and a little expense, she became quite a docile animal. Mr. Bald was known in the valley for having a special way with animals and was in the process of trying to sell this horse. He found an interested buyer who offered him quite a substantial sum of money for the animal, but before the deal was closed, Mr. Bald was riding the animal up the grade road, now Dennison Grade, and an auto was coming down the grade. The auto crowded Mr. Bald and the horse into a bank and rammed the horse. As a result, the animal developed an everlasting fear of the chugging monsters and, of course, the pending sale was off. The trial that followed was one of the funniest events ever staged in the Nordhoff Court. Judge Wilson was on the bench but at times, he was practically on the floor from laughter. The defense had gone to a great deal of expense and time, procuring evidence and witnesses to prove that the animal was a confirmed outlaw and that Mr. Bald was reputed to be the best rider in the country and that at one time even Mr. Bald was unable to ride this outlaw horse. Also, the defense claimed that Mr. Bald had paid only $37 for her. Many witnesses were called, and the trial lasted for hours. In the end, the horse and rider won the suit: however the county newspaper gave Howard Bald quite a lecture in their editorial about his “hogging” the road. Over the years, the automobile would continue to make front-page news. In 1920, state speed cops from the Automobile Club of California came to the valley on a regular basis to explain and to enforce traffic laws. At the same time, elaborate brochures advertising that to reach the Ojai Valley from Los Angeles, there were choices of “three concrete highways.” Our whole world seemed to be centered around the automobile, which in earlier years had been thought of as only a fad. Editor and Mrs. William Randolph Hearst formed a motoring party to the Ojai Valley in 1924 and drove around the valley, they were “delighted with its picturesquesness.” Mrs. Andrew Carnegie, widow of the nations greatest benefactor in public gifts, drove over to view the town of Ojai from Santa Barbara and enjoyed her day as a guest of Mr. and Mrs. Edward Libbey. The automobile was certainly bringing important visitors to the valley. Street signs and Boulevard stop signs became a necessity by 1926. The original street signs were 5 1/2 inches high by 2 1/2 feet long, they had the name of the street in dark blue on an orange background and were placed on each corner of the town. The signs cost the city $40 per hundred and an additional $25 per hundred to have the names printed on them. The Boulevard stop signs were placed on poles at the corner of each street leading into Ojai Avenue. The usual custom of painting stop signs on the roads could not be used as the streets leading into the main street were not paved. A new law to provide penalties for violations of the new stop sign ordinance was enacted. The stately oaks and sycamore trees that stood along the main street in front of the Arcade became victims of the automobile in 1926. The city decided to remove the trees, that Mr. Libbey had protected so dearly when building the arcade, because they were a menace to traffic and that the city would possibly be liable for damages to cars should they collide with them. In 1927, notice was served on the California driving public that the new law setting the maximum speed limit on public highways at 40 miles an hour, was to be rigidly enforced. “Forty miles means 40 and not 45,” was the terse order given to traffic officers. There was to be no tolerance permitted. The speed limit had been 35 miles an hour for many years, but “thousands of motorists have for years technically violated the law by driving up to 40. It will now be possible for them to enjoy this extra five miles and still drive within the limit.” The state believed that this increase would give the drivers a greater respect for the law. 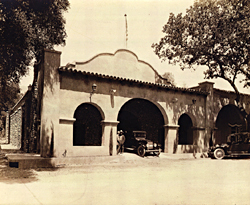 A service station and fruit stand, now Boccali’s, was constructed at the foot of the Santa Paula grade on Ojai Avenue in 1927. The station provided the services needed for the ranches in the east-end. It also had a large picnic area under the trees. The next year Reeves Road was built to give better access to the ranchers living in that part of the valley. Everything was changing to accommodate the automobile and its driver. Along with the increase of automobiles came the billboards along the highways. The problem was so out of hand that by 1930 the National Automobile Chamber of Commerce had to step in, “Advertising billboards erected in large numbers along and adjacent to the highways unnecessarily mar the appearance of the countryside and detract from the pleasures of motoring.” They also felt that the billboards were a positive menace to the safety of operators and users of motor vehicles, by distracting the attention of drivers and contributing to the amounts of accidents. During the World War II, speed limits were reduced and high penalties were given to the offenders, their names appeared in newspapers and they were turned over to the County Civilian Defense coordinator as traffic violators. Three violations and they were turned in to the war rationing board so they could “bear in mind that these persons had violated laws and hindered the rubber conservation program.” Should the violators have appeared before the rationing board for rations, their cases would receive little if any help because of their violations. Today, the automobile is certainly a major part of our society. Without it, most of us would be lost. However, over the years, many of our historical buildings have been lost because of a need to create still one more parking lot. David, I saw your article from 1999, and the orchid town, rancho rinconada. wonderful depiction of the ranch. I lived there as a child for a few months. We were kind of migrants in a way. My father did some plumbing for the ranch, and we actually lived in the town. the pony express was our kitchen, and we slept in the art gallery, and the chinese laundry (my sisters). It was an incredible experience for a kid from south central los angeles directly to a real dodge city in the middle of the woods!